On a related note, this blog will be taking a short break too. Wishing you all a safe and happy holiday season. Do come back and visit in the New Year when there are lots of Guild activities in store including The New Quilt Contemporary Textiles Exhibition at Manly starting on 25 January. This week marks the first anniversary since this Guild blog was officially launched. Comment moderation has been set up on this blog which means any comments will be reviewed and approved before they show up but most messages are cleared promptly. While we have received only a handful of comments in the first year, we hope that more comments will be made in 2008 as this is all part of the fun of blogging and blog reading. Alternatively, if you have a news item that you think might be suitable for posting on the blog, you can e-mail details to the Guild Webmaster. Bring something yummy to share for afternoon tea. 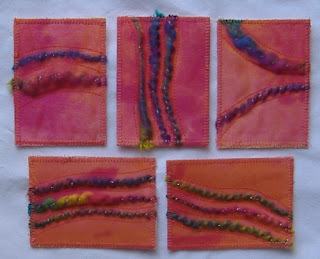 Those inspired to make Artist Trading Cards, following Erica's demonstration at the October meeting, are also encouraged to bring ONE ATC (3 1/2" x 2 1/2") to go into a draw to swap with other participants. 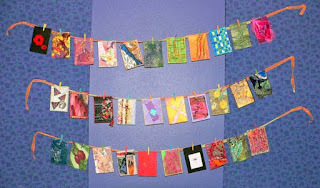 Pictorial Quilts– the definition for Category 14 has been expanded to clarify that quilts must be representation of a person, place or thing. 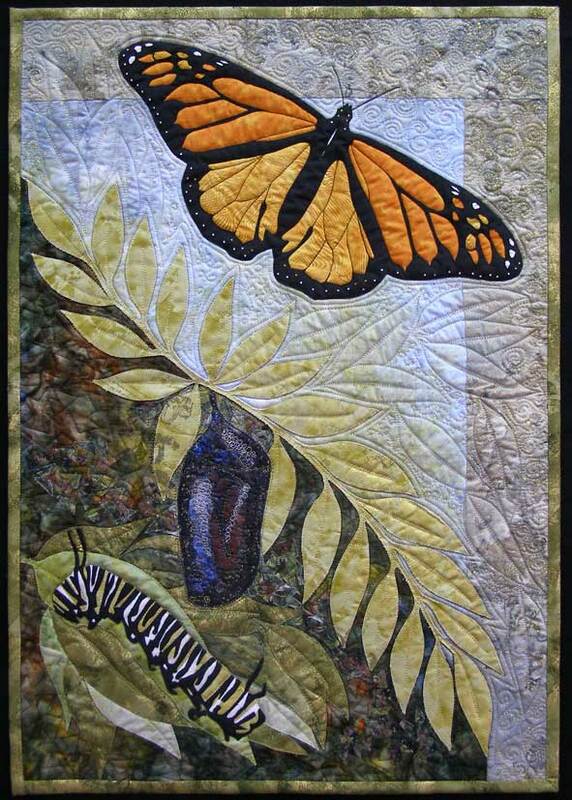 Domestic Machine Quilted Quilts – this category has been deleted due to lack of participation. However, the overarching special award of Excellence in Domestic Machine Quilting continues and you may nominate your quilt for this award by ticking the relevant box on the entry form. 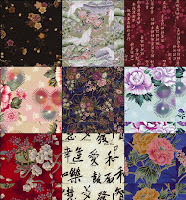 Machine Embroidered Quilts – a new category 16 has been introduced on a trial basis. See below for details. In addition, subject to sponsorship, there will be a new special award for Excellence in Long Arm Quilting. As special awards are given to individual entrants, quilts entered into Categories 5 and 11 are NOT eligible for the Excellence in Long Arm Quilting award. Remember, you don’t have to be a star quilter – the Guild welcomes entries from the full spectrum of its membership from beginners to experienced quilters and from traditional to contemporary designs. Join the Guild and start planning your entry today! Please direct any queries to the Exhibition Secretary. Longstanding Guild Member, Alysoun Ryves passed away on Saturday worn out by a very brave battle with cancer. Alysoun generously contributed to the quilting community at all levels: as a driving force behind Hunters' Hill quilters; active participant of the Guild and Sydney Quilt Study Group; and as a contributor and technical advisor to Australian Patchwork & Quilting magazine. Alysoun has influenced many people and will not be forgotten. There will be a service on Friday the 16th of November at 1:30pm at the Camellia Room, Macquarie Park, Plassey Rd North Ryde. This will be followed by a big party back at the the family house in Woolwich, everyone welcome. Wear whatever you think appropriate however Alysoun's family is encouraging people to wear bright colours and a flower. 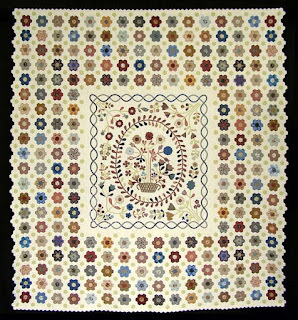 Embroidered quilt made using computer embroidery design software or designs created for computerised embroidery systems including original, digitised design cards or discs. At least 25% of the surface must be embroidered. Minimum size 150cm x 150cm. 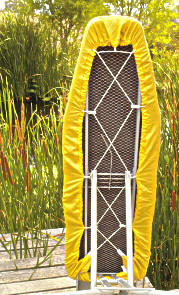 Maximum size 290 x 290cm. If you have a computerised embroidery system on your sewing machine, this is a great opportunity for you to make and exhibit a quilt utilising its features. Quilt show entries close on Friday, 29 February 2008 so join the Guild (if you are not already a member) start planning your entry now! Another very useful resource is the comprehensive listing of Australian quilt shows produced by Sydney Quilt Show sponsor, Down Under Quilts. If you are looking for a quilt show anywhere in the country (plus there are a few shows in New Zealand listed too), visit the Diary Dates section of the website. It is handy if you are planning a trip and want to check if there are any quilt shows on in the vicinity. *The Guild still seeks an editor for the quarterly newsletter. Please see the Position Description for more details. The Broadway Museum in Junee from 9-11 November. Street stalls 10-11 November. only. Opening hours: 10am – 4pm. Entry $5, Concession $3, Children $1. Enjoy the Junee Heritage Lolly Shoppe & Coffee Bar. Participate in the Brian Beasley bushcraft woodwork workshop. See the Going to Pieces, Guild 2006 theme challenge quilts. Enquiries: Dawn Lindsay (02- 6924 1146) or Peter Morris (02 -6922 9337). Please bring along any textiles, including quilts, you have that you would like advice on looking after. Kerrie Bowles, Susan Cunningham, Helen Ducker, Michele Eastwood, Dianne Firth, Cherry Johnston, Camille Lord, Glenys Mann, Barbara Macey, Deborah McArdle, Thelma McGough, Alison Muir, John Parkes, Cath Phillips, Clare Plug, Gail Putz, Beth and Trevor Reid, Elizabeth Rose, Alison Schwabe, Carolyn Sullivan, Sarah Tucker, and Rosie White. Congratulations to everyone and, if you missed out this time, don’t give up! Keep working on what you are doing and next time you may be successful. Remember that non-selection is not a criticism of your work; all chosen pieces are considered in the context of the entire exhibition. It will always happen that good work misses out, and largely because of restrictions in the number of quilts that can be hung. The New Quilt exhibition at Manly Art Gallery will run from 25th January to 24th February 2008. This will be the 12th show, an initiative of the Guild in collaboration with the gallery in which many of our country’s finest quiltmakers have shown their work since 1991. As part of the programme, curator Christina Sumner will give a floor talk on Sunday 3rd February at 3pm. 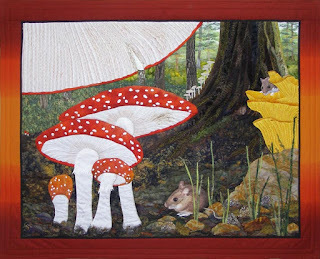 Concurrently in the small gallery there will be an exhibition of quilts of former guild member, the late Judy McDermott, curated by Sarah Tucker, titled Judy McDermott: Speaking for Themselves. Sarah will deliver a lecture during the exhibitions tracing the development of Judy’s unique work in relation to the work of other Guild members in the period 1989-2004.The lecture is scheduled for Sunday 10th February at 3pm. Congratulations to our talented Guild members. As noted in earlier posts on 15 August and 15 October, several Guild members have been selected as finalists at the International Quilt Festival in Houston. Even if you can't be there in person, you can view a webcast of the glorious quilts and celebrations from Thursday 1 November (Houston time). Christine Kontratenko, Denise Sargo, Marilyn Lowder, Kerry Sterns and Sandra Lyons are members of the award winning quilting collaborative - The Materials Girls. The Material Girls are presenting the Friday Showcase, this Friday 2 November 2007 (10am at the Guild office). Join us for the final showcase for 2007! promotion of the Guild's activities and services through The Template. an eye for design (as most quilters have!) and logical organisation of information. 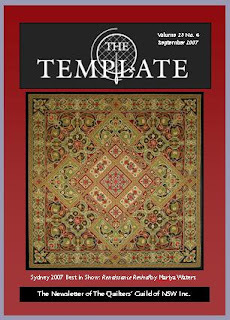 The Template has undergone a revamp and redesign over the past year and the handover to the new editor includes useful files, documents and training as needed. There is about a month between the closing date for copy and sending of files to the printer, so you would have four busier months in the year. Preparation of the December issue is well advanced and many people have offered to assist by preparing articles and reporting on Guild activities. This is a really way positive way in which you can contribute to the Guild's progress. Our newsletter remains a valuable communication to members and record of events. If you're interested and would like more information, please contact me - President Lorraine. As a further attempt to reduce junk e-mails, this e-mail listing has not been hotlinked. Please type the relevant e-mail address onto your computer. Congratulations to Amanda Daly, Helen Godden and Janine Dixon who were awarded the first three prizes in the Guild's 25th anniversary theme challenge - Looking Forward, Looking Back. You can view all of the imaginative entries in the challenge gallery on the Guild's website or by clicking on this slideshow. The challenge theme for 2008 is Coast and Country. Focus either theme element or both! There were 37 entries in the Guild's 25th Anniversary Theme Challenge - Looking Forward, Looking Back. All the challenge quilts will be on display at the Annual General Meeting at Burwood RSL this Saturday, 20 October 2007. Come along and put your vote in for the Viewer's Choice! While you're at it, you might like to join the committee in GOING PINK for October and wear something pink to the AGM. Further to the 15 August post about International Quilt Association Houston finalists, there is more exciting news. Guild member, Helen Godden from Canberra and Annette M Hendricks from Chicago IL USA, Gail E Thomas from Vernon BC Canada have combined their strengths and passion for colour, design and textiles to create an award winning Tri-Nation Collaborative quilt. 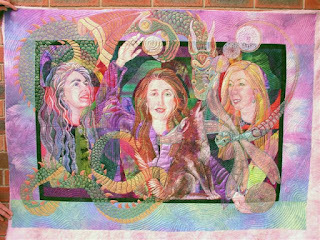 The THREE SISTERS will be world premiered during the Winner’s Circle Celebration at the International Quilt Festival 2007 at Houston (30 October to 4 November). Congratulations Helen! Please note that the Block of the Quarter will be drawn at the Burwood meeting on 1 December 2007 rather than the October meeting. You can participate in the Block of the Quarter by bring your TWO blocks along to Burwood or posting them into the Guild office by no later than Tuesday, 24 November 2007. It's not too late to purchase your copy of a 2008 calendar featuring stunning quilts from the Guild's 25th Anniversary challenge. You can purchase them from the Guild office or using the Calendar Order Form. The calendars are $15 each (plus credit card fee and postage & handling if applicable). Orders of 10 or more calendars in Australia are post-free! The Sydney Quilt Study Group has arranged for Brigitte Giblin to give a presentation of some old French quilts and her own quilts this Saturday. 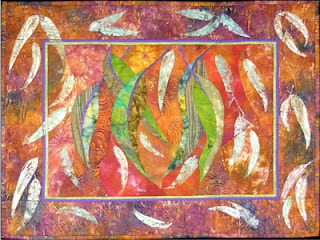 Brigitte will talk about how English, French and Australian quilts have influenced her quilt designs. The SQSG will also have 4 French quilts and a jupon ( wedding skirt) from their committee members' collections on hand for viewing. There will be a raffle, afternoon tea and non-members are welcome. 5 October Friday Showcase: Lynn Hewitt. Guild accredited teacher, and former President, Lynn Hewitt is the presenter of Friday Showcase, this Friday 5 October 2007 (10am at the Guild office). Lynn is also teaching her Winding Ways workshop on 18 November 2007. Click here for the workshop booking form. screening mammography - this is done on an asymptomatic basis (no sign of changes) free of charge for women who are 40 years of age and above at Breast Screen Australia on 13 20 50. This October, the Guild encourages you to educate yourself about the multiple issues related to breast cancer, then take that newfound knowledge and tell someone else what you’ve learned. St Ives High School Auditorium,Yarrabung Rd, St Ives. "Dr Annette Gero, has an immense collection of antique quilts from around the world, but it is her Australian quilt collection that is a National Treasure. 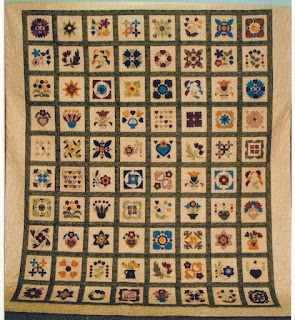 The quilts range from the utilitarian 'waggas' made out of necessity during the Great Depression, to highly decorative crazy patchwork made for trade or agricultural exhibitions." 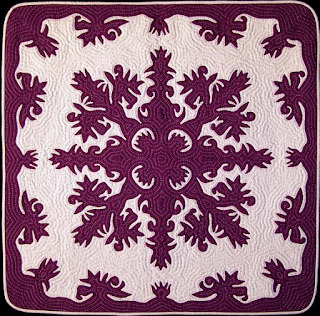 If you are new to quiltmaking or have had the delight of introducing someone else to this creative endeavour, don't forget that the Guild has a special "Beginner Quiltmaker" category in its annual member's exhibition - the Sydney Quilt Show. 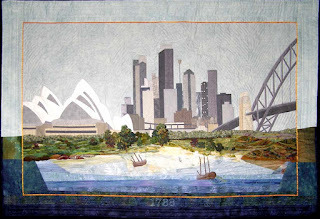 If your first quilt was completed since January 2007, and you are a member of The Quilters Guild of NSW Inc, you may enter that quilt in the "Beginner Quiltmaker" category at the Sydney Quilt Show in June 2008 which has a great prize of 20 metres of fabric! September Newsletter Out this Week! 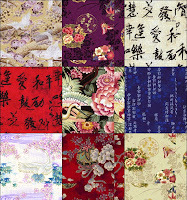 the [revised] closing date for entries in The New Quilt 2008 is Friday 5 October 2007. The nomination form and relevant entry forms can be downloaded the side bar to this blog. Singleton Quilters is holding its Treasures of Yesteryear exhibition this weekend. Display of antique sewing machines, members’ quilts and handiwork. Bou-saada Winery, Kells Creek Road, Mittagong. Carolyn will also be making a short presentation about her book before the Annual General Meeting at Burwood on 20 October 2007. Attends committee meetings each month. This position on the guild committee gives you a great chance to expand your horizons, get to know many more fellow quilters and supplement your talents. Please contact the President if you are interested in this position. (Click here to download a Committee Nomination Form). Look for your copy towards the end of September. It will have a complete list of show winners, lots of images and of course Guild reports and activities. This is an ideal opportunity for you to directly contribute to the administration and activities of the Guild. If you are interested, please complete and return a Committee Nomination Form. The closing date for nominations is 1 October 2007. Epping Quilters Inc. will be holding their exhibition "Stitching a Legacy" celebrating their 25th Anniversary, this Friday 31st August and Saturday 1st September at St. Alban's Church Hall, 3 Pembroke St, Epping (please note new venue). As well as quilts, there will be a craft stall, fabric shop, antique quilts, raffle quilts and cafe. Raffle proceeds will go to the Patricia Ritchie Centre for Cancer Care and Research at the Mater Hospital, North Sydney. If you enjoy making contemporary quilts or experimenting with unusual design or construction techniques, please consider submitting an entry to Guild's forthcoming exhibition The New Quilt 2008:Contemporary Quilt Textiles. Entry is open to all quiltmakers (including non Guild members and non-Australian residents). Work must not have been previously exhibited in New South Wales and must have been completed since January 2006. Entries close on 5 October 2007 (new closing date). The Quilters' Guild of NSW has selected Interface Pty Limited as their special 25th anniversary partner to help the Guild raise funds for the Community Quilts project. Every year Guild members make and donate "Community Quilts" quilts for a number of charities including The Smith Family, the Salvation Army, Blankets of Love and for foster children. Interface Australia, and its rural Australian workforce of men and women with disabilities, make the "Fitz Like a Glove" ironing board cover, Best Boy ironing cloth, thick felt underlay and many other fine products. For the year ending 30 June 2008, if you quote the code "QG 25" when purchasing Interface Australia products, they will donate 20% of the sale (excluding postage) to the Guild's Community Quilts project. For your assistance, here is an Order Form. Congratulations to Guild members Judy Day and Nicole Bridges on their success in the Festival of Quilts, Birmingham, England. Judy was awarded first place for her small traditional Hawaiian quilt and Nicole and Gay Jenkins received second prize for a quilt that Nicole machine quilted. Warm to the joy of textiles and see the vision of what makes a golden glow - a pear ripening, a field of daisies, coins, sunlight, moonlight, love...and the techniques! So many! Large and small! Ecstasy! Curated by Helen Lancaster. To celebrate the Guild's 25th Anniversary, the theme challenge for 2007 is "Looking Forward: Looking Back". The quilts are displayed at the Guild's Annual General Meeting in October and the winners and Viewers' Choice are announced. After the Annual General Meeting, the quilts become a touring suitcase exhibition travelling all over Australia for up to two years. They are returned to the makers at the end of the tour. The challenge is open to all Guild members and entry is free. Quilt size 50cm x 70cm - portrait or landscape with hanging sleeve. 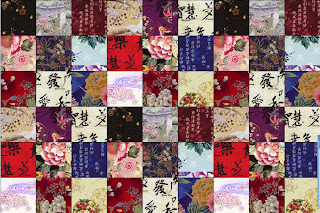 Quilts may be made using any technique or material. However, they should conform to the definition of a quilt, i.e. three layers. More information and entry forms can be obtained from the guild office. Mariya Waters - Renaissance Revival. Introduction of New Quilt Show Category? For some reason, there seems to be a high concentration of talented quiltmakers in the Canberra area so the exhibition is sure to delight and thrill. And while you are in the national capital this week, catch a viewing of the Rajah Quilt at the National Gallery and also see the Eyeline Exhibition by the tACTile group at the Australian National Capital Artists Gallery. Blogging is a powerful social networking tool and enables people all over the world to share their passions and interests. Former Guild committee member, Chrissy Sheed, now resides in New Zealand and has recently ventured into Blogland with her aptly named new blog: Chrissy - New Beginnings. If you are a Guild member, and have a quilting-related blog, contact the Guild Webmaster to have your blog added to the Guild's blog roll in the side bar (see right). If you subscribe with Bloglines or Google Reader, these services allow you to set up a list of your favourite blogs on your computer. Then you can simply go to the list to see if a new article has been added to any of the blogs. Remember, if you have a news item that you think might be suitable for posting on the Guild's official blog, you can e-mail details to the Guild Webmaster. Fountain Court NSW Parliament House. Open weekdays only. 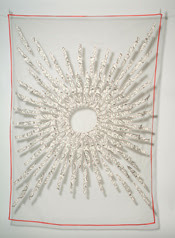 Includes pieces from the Embroider's Guild’s permanent Ccllection. 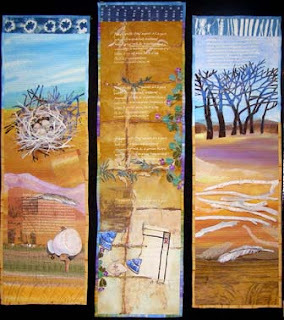 In 2007, the Guild's 25th anniversary year, the challenge quilt theme is Looking Forward, Looking Back. Entry is limited to individual members of the Guild. The size of the finished quilt must be 50cm x 70cm which may be hung in portrait or landscape mode with a 6cm deep hanging sleeve attached to the back. Entries close on 28 September 2007 and must be accompanied by a completed entry form. The Template has undergone a revamp and redesign over the past year and the handover to the new editor will include useful files, documents and training as needed. There is about a month between the closing date for copy and sending of files to the printer, so you would have four busier months in the year. This is a really way positive way in which you can contribute to the Guild's progress. Our newsletter remains a valuable communication to members and record of events. If you're interested and would like more information, please contact Editor Ruth.